Vapour Phase affords much better control and stability over the entire soldering process, compared to traditional reflow soldering, regardless of board characteristics. The Vapour Phase process works by heating the PCB, which has already been through screen-print and one or more pick and place stages, in the vapour of boiling Galden, an inert liquid which is ideal for the wetting of lead-free alloys without risk of oxidation. 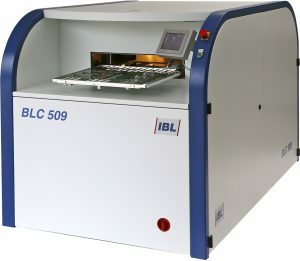 For instance, the PCB to the right was produced using the Vapour Phase oven. It has 75µ track / 85µm gap over nearly all of its area, approximately 10,000 microvias, approximately 8,000 conventional vias, and 22 layers in a flexi-rigid construction (giving a total thickness of 2.5mm). This combination of features makes the board extremely challenging to assemble using traditional reflow techniques. PCBs manufactured using Vapour Phase do not experience the high temperature differences (‘delta Ts’) typically produced during traditional reflow soldering, which can cause component and/or board damage. 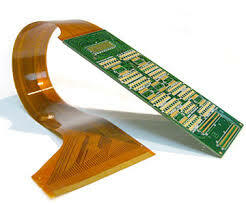 For example, the large thermal mass variations between the rigid areas and the flexi limbs of the above PCB, combined with the wide variety of component types, demand a very controllable soldering process. Indeed, for boards of this complexity, and greater, Vapour Phase is fast becoming the only way guaranteeing consistently high production yields. If you would like to know more about vapour phase or any other services which will benefit your manufacturing needs please do not hesitate to contact us.